When I heard the show name, “My Cat from Hell,” it sounded at first like the kind of “anti-cat” propaganda I get upset about. 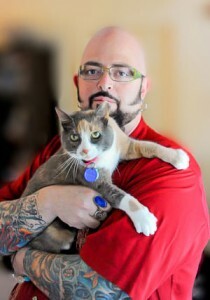 At its core, My Cat from Hell is about solving the very cat behavior issues that send thousands of cats back to shelters to likely be euthanized every year. An adult cat with behavior problems is not a likely pick at the shelter. I had the great joy of interviewing Animal Planet’s cat behaviorist, Jackson Galaxy, yesterday (full interview post coming soon!) and I can assure you that Jackson is a man on a mission. He believes in the possibility of a day when all cats will have homes, and shelter euthanizations will be extinct. On My Cat from Hell, you get to see Jackson walk into a dramatic situation (flying fur and tears) and quickly read what’s going on with the cat, what’s going on with each human, and what can be done to fix it. It’s so satisfying to see him bring harmony back to a seemingly impossible situation. And I appreciate that the show doesn’t take the easy way out. They could have just had Jackson blow through a bunch of messed up cat households, yowling advice at them. Drama, shame, drama – without resolution. Cat is saying "I'm supposed to pretend that camera crew isn't here?" Instead, they take the time to film Jackson visiting the home weeks later to see exactly how things have changed (or not). If a lot more troubleshooting is needed, we get to see what happens there too. His solutions are inventive and his patience seems to approach infinite. He did mention to me that he meditates. This may have something to do with it. One of the best things about the show is that even long-time cat lovers like you and I learn new, useful information from it. Cats are one of life’s great mysteries, and Jackson’s understanding of them goes deep. If you’re in the U.S. check your Animal Planet schedule for airing of the show on Saturday evening, starting January 7th, 2012, 8pm ET/PT. If you aren’t in the US, but do have Animal Planet, sit tight: Jackson’s show is coming to your part of the world too. You can also catch all of last season on iTunes here. Check out the new season’s preview here. In the new season, he deals with some problems that are new even to him. Did I mention I am also so excited to post my interview with Jackson?! Some of his answers surprised me! I hope you’ll keep an eye out for it. We have a 14 yr. old female cat that has suddenly started pooping on the floor. She urinates in her litter box and will take a look at the clean litter box and then poop on the floor.Before she poops , she walks in the room in a vocal state. We have started giving her Laxatone on her nose , thinking this may be hairballs, because she does have long hair She sometimes throws up after she poops so we gave her Laxatone. The throwups are a concern but the poop situation is our main concern. Please advise if you can. Hi JoAnn, I would guess she’s having hairballs and/or constipation (they are often related). What works great for that is Vet’s Best Hairball Relief Digestive Aid, available on Amazon. Really looking forward to the rest! And thanks for the update on the rest of the world, all the other interviews I’ve read just mention the US airing. I’m in Australia and CANNOT WAIT to watch this show, I love Jackson. Why thank you, Purr Diaries! Yes, I’ve noticed Australia is country that *loves* cats – Animal Planet would be damn fools not to air this show there. Lots of readers from Australia around here. I should caveat though that I didn’t not confirm the global airing with AnimalPlanet, I’m just going on what I heard Jackson say to me. Liz, I can’t wait to read the rest of the interview. Those are enticing teasers! We’re really hoping my Canadian friends and readers get to watch eventually. It’s interesting he never mentioned meditation before. I find meditation a valuable tool connecting with pets. Will share this on our FB page. Good news, I actually asked Jackson about airing in Canada and he said YES indeed it will play in Canada at some soon future date.